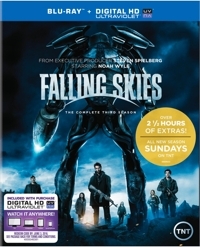 Falling Skies is as out-of-the-question for younger children as any monster or war movie would be, because it’s essentially a combination of the two. But families with older children will find it easy to get hooked on this series about a group of humans who’ve survived an alien invasion and are now fighting as an underground unit to reclaim the planet and perpetuate the species. My ‘tweenage daughter doesn’t like historical dramas, isn’t a fan of westerns, and loves fashion so much that it’s like fingernails-on-the-chalkboard to watch the Ingalls girls parade about in their dowdy homemade calico pioneer dresses and bonnets. But she liked Little House on the Prairie: Season 2 enough to want to keep watching one episode after the other, and to shelve it in our collection for future play. This wholesome family TV series from the ‘70s still has broad appeal, as you can see from the clip of the cast reuniting on The Today Show (link above) to promote the release of the Blu-ray on Season 1 and now Season 2. 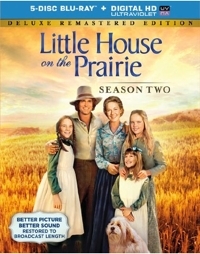 The first season was more the authentic pioneer experience, as Pa and Ma Ingalls (Michael Landon, Karen Grasse) moved their brood of three daughters from Wisconsin to Kansas and finally Minnesota. There were Indians and hardships of every kind, and the emphasis was on the family’s journey and settlement. Entire family: Theoretically, but . . . There are three types of people who will go for Sophia Grace & Rosie’s Royal Adventure: people who are charmed by the duo’s YouTube videos, fans of Toddlers & Tiaras, and Ellen DeGeneres. And if only some members of your family fall into any of those categories, you can be sure that the rest will groan or complain all the way through this film. Sophia Grace and Rosie first appeared on Ellen in 2011 when they were eight and five years old, respectively, and the older girl performed Niki Minaj’s “Super Bass” while her younger cousin went through the motions alongside her because it made her less nervous. More appearances (and many more YouTube videos) followed, with the pair acting as mini-journalists and doing Red Carpet interviews—always in their trademark pink princessy dresses and tiaras. Then they were recruited for two episodes of the Nickelodeon sitcom Sam & Cat, in which teen stars Jennette McCurdy and Ariana Grande’s characters had to babysit two two-faced “BritBrats” and later had to deal with the “Revenge of the BritBrats.” Even without watching those episodes you can see how the girls’ onscreen personas have been shaped. Now they’re on their own with no Ellen and no teen stars. Can they carry a movie? Yes indeed, if you happen to like them. If not, it’s like being trapped in an elevator with a valley girl who’s a nonstop chatterer intent on giving you a play by play as she scales Mount Inanity. 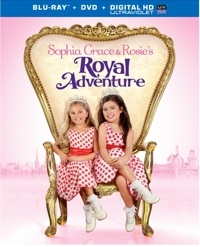 In their Royal Adventure, Sophia Grace & Rosie are sent to Switzelvania as correspondents for Ellen in order to report on the coronation of a new queen, but when they arrive they find that three princesses are scheming to get that crown. And so these “journalists” decide to make the news instead of reporting it by plotting and coaching so that the best candidate wins. Of course the humor is played over-the-top and since the film is a showcase for Sophia Grace & Rosie they don’t have to steal each scene—it’s handed to them on a silver platter. Though they overact in the manner of way too many child actors, Sophia Grace & Rosie still impress with their ability to memorize scenes and play to reaction shots. I mean, they’re still only 11 and eight years old, and they really do an amazing job of just being professionals. But over the past three years it seems that the older cousin has gotten more full of herself and therefore more annoying . . . unless you’re a fan of Toddlers & Tiaras or are big fans of Sophia Grace & Rosie because you like their act. Very little girls who are into pink and all things princess will enjoy this movie as well. But for everyone else? It’s like watching a Shirley Temple imitator at a talent contest who tries to act cute, rather than being cute and not knowing it. They’re great in small doses, but the girls make this 75-minute feature feel a lot longer. 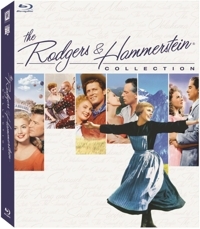 Rodgers & Hammerstein are Broadway legends, having won a total of 34 Tony Awards for their work. They’ve done all right with film adaptations, too, earning 15 Academy Awards. So if you’re a fan of old musicals and want to share that with your children, it might be tempting to pick up this collection. But don’t do it because you think it will be a good resource should your children get a part in a future high school musical. According to The Broadway Scoop, not one Rodgers & Hammerstein musical ranks among the Top 10 Musicals currently being performed by high schools. Does that mean they’re dated, or as corny as Kansas in August? Some of them, yes. For that reason, it might be better to wait (right now four out of six are only available through this collection) to buy these titles individually, rather than as an eight-disc, six-film collection, because while two of the films are surefire winners and two are entertaining-enough slices of rural Americana to where they will be of marginal interest to younger viewers, the remaining two musicals feature topics that won’t engage children much. The King and I and The Sound of Music, with 10 Oscars between them, are the most likely to have wide family appeal. They’re colorful spectacles, and both of them have a large cast of children that will interest young ones. 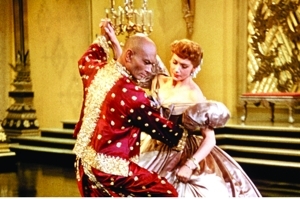 Set in the 1860s, The King and I features Yul Brynner as the King of Siam, who, in his desire to become a more “scientific” ruler, has decided to educate himself and to hire a teacher to instruct his many children. Deborah Kerr is the English widow who arrives with her son and falls in love with the children (as we do). Audiences also love the give-and-take sparring between her and the king, while everyone around him is so fearful of his authority. She helps him put on a state dinner for visiting western dignitaries to prove he’s no barbarian, and he charms her with his own grace and gratitude. The costumes are lavish, the songs are wonderfully catchy—like “Getting to Know You,” “Shall We Dance,” and “I Whistle a Happy Tune”—and they have core messages that will resonate, even with children. The ending is sad and it might take some discussion to frame it for your youngest, but The King and I still has wide appeal. Unfortunately, the film isn’t out on Blu-ray except in this collection. The Sound of Music is already available as a stand-alone Blu-ray title, and in fact if your family likes bonus features the stand-alone is the better buy. That’s because the second disc of bonus features on the stand-alone is not included in this set—an unfortunate omission. But the film is a triumph. 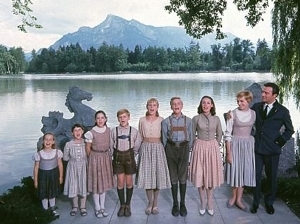 It overwhelmed audiences from the start with its story of the von Trapp family singers, who fled Austria for Switzerland during the Nazi occupation. Entertainment is one thing, but there are times when, if something out of Hollywood has become part of our vocabulary or is frequently alluded to, you need to see a film or TV show just to be culturally literate. That’s the case with Happy Days: Season 5. Maybe you’ve heard of the expression “jumped the shark”—the precise moment when a TV series gets a little too wonky and begins to go downhill? That phrase comes from a triple episode that launched the fifth season of Happy Days, a popular series created by Garry Marshall and set in Milwaukee, circa the 1950s and early ‘60s. 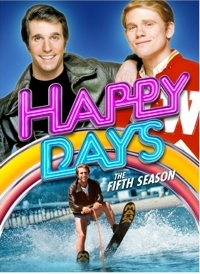 This season in California, Fonzie (Henry Winkler)—whose trademark catchphrase “Heyyyyyy” had already become a part of pop culture—is faced with a water skiing challenge and must jump over a man-eating shark that’s penned in an enclosure near the beach. The Honeymooners began in 1950 as a comedy sketch on Cavalcade of Stars, a variety show hosted by Jackie Gleason, and continued with The Jackie Gleason Show. 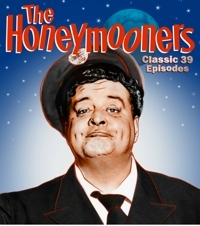 The Honeymooner sketches became so popular that five years later they aired for a season as a half-hour situation comedy, and it’s these “39 classic episodes” broadcast on CBS that are featured on this Blu-ray. Shot for the most part on a single set depicting the shabby New York City apartment of bus driver Ralph Kramden (Gleason) and his longsuffering wife, Alice (Audrey Meadows), The Honeymooners had the feel of a stage play, with character entrances sparking plenty of applause—especially when tenement neighbors and good friends Ed Norton (Art Carney) and his wife Trixie (Joyce Randolph) walked in. So here’s the puzzler. The basic set-up—two couples living in apartments above and below each other, with one gender getting into mischief—is the same as I Love Lucy, and yet our kids don’t find The Honeymooners nearly as entertaining, despite being #3 on TV Guide’s 50 Greatest TV Shows of All Time, right behind Lucy.